"What kind of a princess are you?" Disney has debuted a full-length official trailer for the animated sequel Wreck-It Ralph 2, titled in full Ralph Breaks the Internet: Wreck-It Ralph 2. This is the latest big movie from Disney Animation in Burbank, and it looks like so much fun, of course. John C. Reilly returns as the voice of Ralph, the "bad guy" who is really a good guy, from the first Wreck-It Ralph released in 2012. 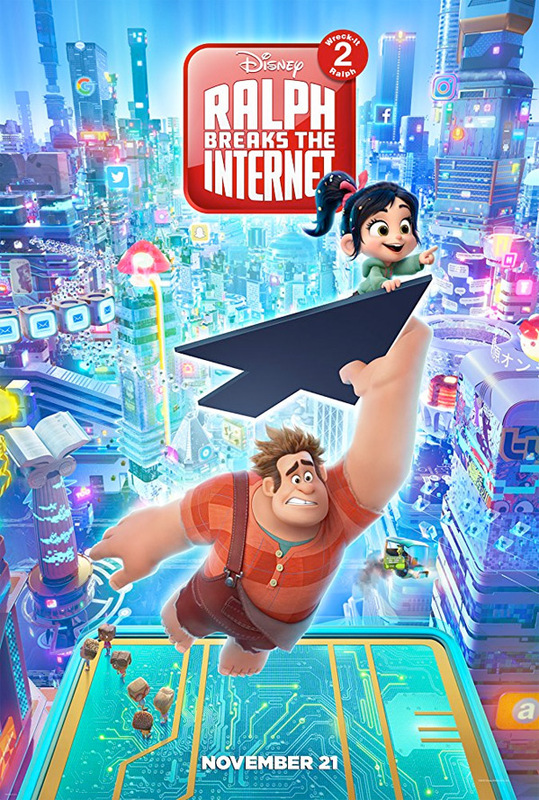 This time he follows Vanellope, voiced again by Sarah Silverman, into the internet and there they meet the "netizens", getting in all kinds of trouble and, as the title says, they wind up breaking the internet. The full cast features Taraji P. Henson, Kelly Macdonald, Kristen Bell, Mandy Moore, Alan Tudyk, Jane Lynch, Idina Menzel, Jack McBrayer, and Jodi Benson. This looks like a worthy sequel, going bigger and better but still maintaining the heart and honesty and goofiness of the first movie. And the bit with the princesses at the end is epic - I can't believe they're doing this. This is going to be a huge hit. Enjoy. You can watch the first teaser trailer for Disney's Wreck-It Ralph 2 here, to see a bit more footage from this. Ralph Breaks the Internet: Wreck-It Ralph 2 leaves Litwak's video arcade behind, venturing into the uncharted, expansive and thrilling world of the internet—which may or may not survive Ralph’s wrecking. Video game bad guy Ralph (voice of John C. Reilly) and fellow misfit Vanellope von Schweetz (voice of Sarah Silverman) must risk it all by traveling to the world wide web in search of a replacement part to save Vanellope’s video game, Sugar Rush. In way over their heads, Ralph and Vanellope rely on the citizens of the internet—the netizens—to help navigate their way, including a webite entrepreneur named Yesss (voice of Taraji P. Henson), who is the head algorithm and the heart and soul of trend-making site BuzzzTube. Ralph Breaks the Internet: Wreck-It Ralph 2 is again directed by animation filmmakers Rich Moore (Wreck-It Ralph, Zootopia) & Phil Johnston (co-writer Wreck-It Ralph, Cedar Rapids, co-writer Zootopia). The screenplay is written by Phil Johnston and Pamela Ribon, with Jim Reardon. Disney releases Wreck-It Ralph 2 in theaters everywhere on November 21st this fall, Thanksgiving week. Your thoughts?